Hello Dealsnloot Readers,Future Pay is a digital wallet for shopping across Future Group stores such as Big Bazaar, Ezone and Home Town. Now Future App is offering a Superb offer to attract new users where you will get Rs 100 on signup. 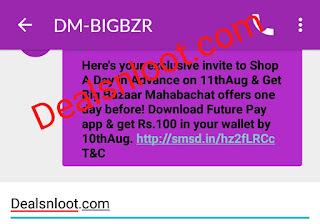 This signup bonus can be used to make payment transaction on future group stores like big bazaar, hometown etc. This is limited period offer and can be expired anytime. So hurry up and grab this Loot Offer. Note :- This is Tested and working fine and we will get the Rs 100 credits by 10th August 2017 (Not Instantly) !!! Enter your Mobile Number & Proceed Next. Now enter Name, Email, Password & Verify Number via OTP. Finally you will get Rs.100 in your wallet on 10 August 2017. Enjoy the biggest loot of Future Pay app. 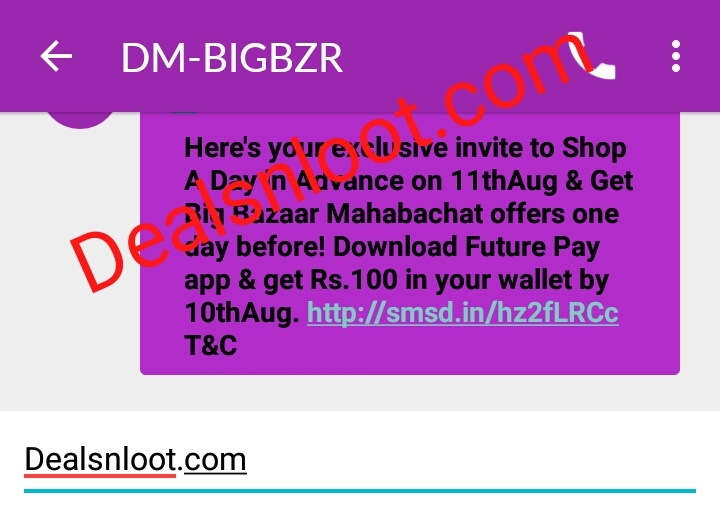 You can use Future Pay wallet in Big Bazaar (Free Shopping at Big Bazaar worth Rs.100). 3. Give Your Future Pay Mobile No. 100 wallet credit does not require any minimum purchase. This can be used only between 11th -16th August, 2017, post which 100 credited in wallet will expire. 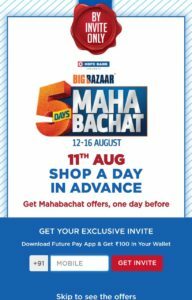 Shop a day in advance is an exclusive Invite only event where in customers get the same MAHABACHAT offers a day in advance. The product pictures are indicative of the offers and may not match with the actual products. 100 Free wallet credit is applicable for new Future pay download customers who have registered on Future pay between 4th – 10th August, 2017 only. Now open Fast reboot and reboot it then follow the beginning process for each new signup. Then go to cashier Counter & ask them to load the money into your future pay account. Now ask them to add 100 in your future pay wallet. You have successfully added money to another main future pay wallet.